Our Annual Meeting will take place at the Red Lion, High Street South between 7.30pm and 9.30 pm. It will be mostly a social occasion and a chance for discussion with our guests. There will be some formal business. In preparation here is a draft report on our activities in the past year. The financial sections will follow. 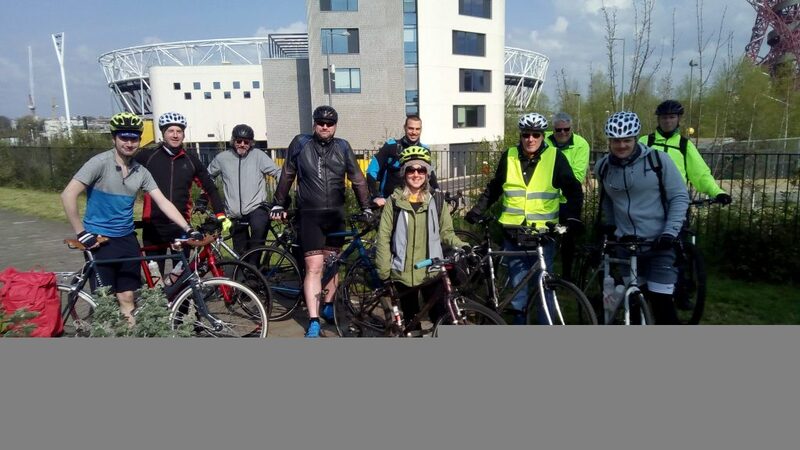 10 of us set off in fair weather on Sunday from View tube bikes in the edge of the Olympic park –along Channelsea path (once a canal) leading to the greenway up the excellent new ramp at Abbey lane –here we passed Abbey creek –leading to the Chanelsea river. We rode the greenway (river of sewage?) as far as we could to Becton & the Gallions reach shopping park, skirting the new developments we caught our first sight of the Thames. Following the river path we passed through Gallions point Marina, Royal Victoria Gardens to arrive early for the first Woolwich ferry of the day. 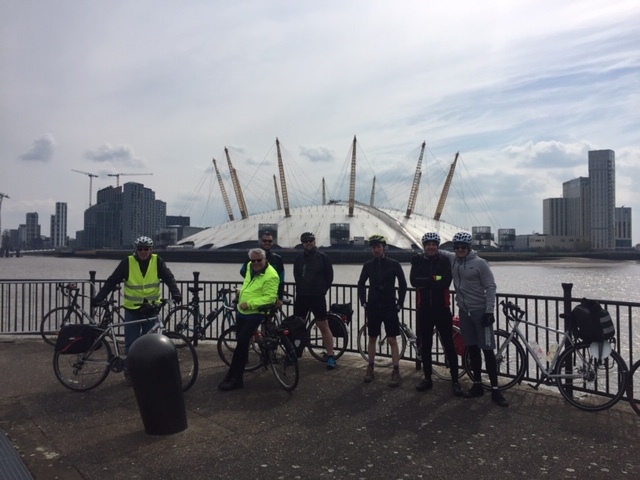 The new Ferries have a separate section now for bikes that easily catered for our group and other cyclists using the crossing with us –they even have a seated area sheltered area for cyclists –we did not need as sun had come out and we enjoyed views up and down the Thames. After disembarking we followed the river path and Quietway 14 using the new bypass section that kept us away from the busy Woolwich rd –leading us to the Thames barrier off road! QW14 lead us on past Greenwich Yacht club, many new developments as well as industrial areas along some excellent cycle paths to our lunch stop at the cafe under the Emirates cable car –here we lost a couple of riders –one heading back to Bexley the other taking the cable care (for the first time ) back to Newham. On past the O2 only one small path diversion remained before cutting through the old Naval college in the University of Greenwich, past the Cutty Sark to take the foot Tunnel back across river to Isle of Dogs. Passing through island gardens we continued along the Thames path, passing beach at Amsterdam rd, over blue bridge onto East India dock basin (see second photo) We decided to divert into the new development London City Island surrounded by the River Lee meander through the Bow ecology park then over Newham way to Cody dock for a brief comfort break. An easy 20ish mile ride with many riders discovering new places – even after many years in the area! 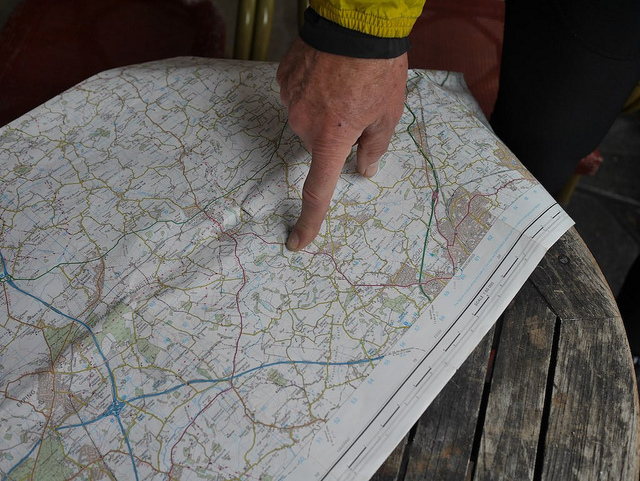 Sorry no map as I had a technology malfunction(S)! We met at Stratford Library – a new venue – thanks to Trevor Mbatha. there was the usual crowded and interesting agenda. Laura Shelton, a Crossrail Walking and Cycling Ambassador started us off, being available to mark bikes before the meeting. At the meeting proper she explained her role and some of her ideas for increasing cycling around stations and for staff. She explained that current policy will be for Crossrail to carry bikes – off peak- over all its lines (including the central underground tunnel. Richard Wadey (Newham Council Sustainable Transport Officer) unravelled how Newham was proposing to spend the £2-3m pa TfL funding to promote the Mayor of London’s Transport Policy. For details see the earlier post of the catch up meeting with him. Headlines are that the big ticket items will be for (a) progressing design of Liveable Neighbourhoods (Forest Gate North in partnership with Waltham Forest and Woodgrange Estate). These would link to TfL’s accelerated interest in tackling the Romford Rd strategic cycling corridor; (b) forwarding design for some other strategic cycle corridors and completing improvements to Greenway and its ramps (e.g. at Newham General, Upper St) and a path through West Ham Memorial Park; (c) progressing design for key junctions on TfL’s identified strategic cycling routes, particularly the Barking Rd and (d) continuing the successful training and cycle hanger programme. He also explained various potential sources of funding to convert design into actual infrastructure. This is in addition to the Freemasons Liveable Neighbourhood for which Newham’s bid was successful, and other projects on the fringe of the borough such as Ilford Hill, the crossing of the Roding at Ilford and the Ilford to Barking route. Trevor led discussion on the proposed “Greenway Challenge” event he was promoting on either the first or last Sunday of Bike Week. He had set up a number of partnerships already to get this event off the ground and we indicate a positive wish to help. Also during Bike Week we decided to seek 13 June for a Bike Week partnership event with Stratford Original to promote and celebrate the improvements brought by the removal of the Stratford Gyratory. Jonathan updated us on the Queen Elizabeth Olympic Park and the disturbing approach of the LLDC (the Planning Authority) whose current Design Guidance includes some real cycling howlers. We are going to have to get down to detail to update them not only on current practice but also to bring to their attention the historic mistakes make in the QEOP. Richard Stevenson is pursing a Councillor Ride to ensure that the Newham Councillors who cycle get a better idea of what cycle infrastructure is possible and in place elsewhere. Partnership Rides with Clapton CFC on 27 April and Bike from Boleyn on 4 May are coming up. A chance to mix football (of your choice) with cycling. And of course our own ride season is now in full swing. Our Annual Meeting will take place on 29 April at the Red Lion 80 High St South East Ham 7.30pm to 9.30pm Light refreshment will be provided. Whilst predominantly a social/discussion event with guests we will have some formal business, particularly the election of Officers. Anyone who would like (or think they may like) to take a more active role in Newham Cyclists is encouraged to put their name forward. We want to continue to be a vibrant group. The sunny and calm weather made for near perfect conditions for this ride. 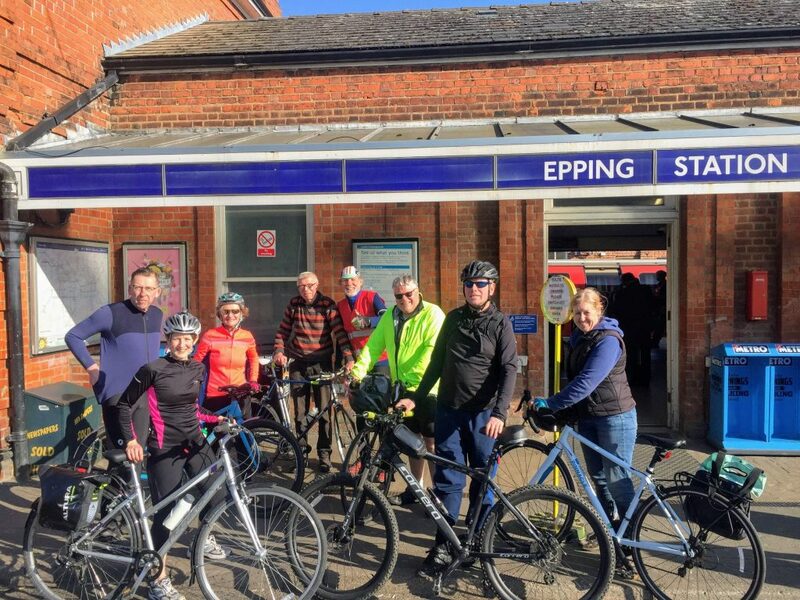 Eight of us met at Leytonstone station as usual to take tube to Epping for the start. We followed the B181 out of the town and through the countryside to Epping Upland, Epping Green and Roydon. Over the river Stort and the level crossing and deeper into the Hertfordshire countryside, through the pretty villages of Hunsdon and Wilford to Much Hadam. We turned east and passed a field full of sheep with their newly born lambs, cross a ford on the river Ash and climbed the hill towards Perry Green. The Henry Moore studios and gardens are not open until 3 April, although some of his iconic statues can be seen from the road. We rode through Green Tye and saw a pillbox that used to guard a long forgotten WW2 airfield. We passed Thorley woods where the notorious murderer Harry Roberts lived while hiding from the police. We took the back route through Sawbridgeworth and crossed the locks and railway line and we were back in Essex. The Fox at Matching Tye was our lunch stop, there were two other cycling clubs there, including a big group from Redbridge. I wonder if any had attended the Redbridge LCC meeting? The last leg inevitably included the Toot Hill rollercoaster before climbing back up to the station to catch the train home. Well done to all participants, especially those that had not done such a long distance (38 miles) before. -The chart references areas affected by the draft LIP bid. -There has been an increase in cycling in Newham on CS2 and the Greenway (Quietway 22). -Cycle training has a high demand. -There is also a High demand for secure cycle storage. Any question please contact me through the Newham cyclists contact e-mail. The weather forecast was predicting rain and some strong winds so the destination of a well insulated, dry and extremely safe bunker seemed perfect. Near Navestock we had our only puncture, but this was soon fixed and we were on our way. Once again we entered the secret bunker via Beacon Hill, ignoring the warning signs, and parked our bikes next to the missiles for extra security. Following the coffee break we continued to Kelvedon Hatch and then to Stondon Massey and the Bricklayers Arms for the lunch stop. Refreshed we headed into the wind, although the rain had stopped, towards Ongar. This well cycled path took us past Greensted Church, back to Toot Hill and the rollercoaster. The advantage of the hills is that we were all warm as we concluded the ride at Epping. The time triallers were all long finished by then but we had enjoyed our route at a slower pace and witnessed the changing times as the secret place of greater safety for five hundred has become a museum . We are expecting shortly to receive a copy of Newham’s Local implementation Plan (which sets out how the Council intends to spend its TfL transport infrastructure grant). This will need detailed consideration. TfL are expecting to announce their funding for Liveable Neighbourhood projects. we are optimistic that there may be one in Newham. There was an update on the Stratford Gyratory cycle event run that afternoon afternoon by Newham Council. It gave an opportunity to chat generally with Council Officers. All “snagging” suggestions” for this scheme to go to Olawale (our Local Infrastructure Rep) for him to collate. we need to keep an eye on the restoration of bike parking and enforcement. Our April meeting will be our Annual Meeting with guests. We will be electing officers and anyone who would like to contribute as an officer would be welcome. Formal notice will be issued later. We will also pursue a private meeting with key Councillors. We discussed arrangements for a new partnership ride with Clapton FC from the Old Spotted Dog to their game at Wadham lodge on 27 April. Bike from Boleyn, another football related partnership ride, is scheduled for the following Saturday. We discussed our contribution of organising a ride to support the relaunch of Redbridge LCC starting at the Quaker Meeting House on Bush Rd 2 March, 11.00 am. We discussed suitable responses to the reconsultion on proposals to remove humps in Capel Rd. We discussed a possible partnership with Stratford Original (a business improvement project) who are planning a event related to the new Stratford town centre layout. We discussed the Council’s unsatisfactory plans for Greengate St/Barking Road and decided to take the matter up at the political level based on our response to the consultation. We discussed development in the Olympic Park and Westfield, noting LLDC’s reluctance to follow the London Mayor’s new cycle standards, and the opportunity to leverage development funding for sustainable transport improvements. All proceeds from tickets sales go to AAA – and a portion goes to the Cycle Club that we support. A goodly crew of 15 gathered in Durning Hall, Forest Gate on 28 January for our first meeting of 2019 and the first for a couple of months. There were a number of interesting developments. We discussed the briefing given by Murray Woodburn on Newham’s Local Implementation Plan (LIP) which is the bid for money from TfL for infrastructure projects. The bid has not yet gone to TfL to the change in the responsible Newham Cabinet Member, who had yet to approve it, and we were not shown any specific details. However from what Murray was able to show us from the general principles governing the bid were strong on sustainable transport. This year TfL are scrutinising LIP bids closely to ensure they contribute to the Mayor of London’s Vision and LCC itself is also looking at them closely. If the bid meets the principles it should pass these tests and, more importantly, progress sustainable transport in Newham. Queeen Elizabeth Olympic Park: Following our letter on the inadequacies of the cycling provision in the Park (see earlier post), we have sent objections to LLDC in respect of the cycling provision included in the Stratford Waterfront proposal. Jonathan will represent us at the next meeting of LLDC’s Sustainable & Active Travel Group. Olawale is pursing a possible link with the Bobby Moore Academy which is also interested in pushing sustainable transport. Olawale updated us on an audit rides of the Ilford – Barking-Barking Riverside and CS3 – Barking routes. He also reported that the “Ilford Gardens” scheme to improve Ilford Hill and the Romford Rd /North Circular junction was lilkely to start this year. We decided to pursue an invitation from Stratford Original, the local Business Improvement District Group, to mark the completion of the Stratford gyratory works (when it happens). We are also pursuing various issues connected with these works. We will contribute to the relaunch of hte Redbridge LCC group. Our ride season has kicked off (see previous post). we tweaked our calendar. It was a beautiful, bright and cold winter morning as we gathered outside the Parisienne cafe at Leytonstone station for our first ride of 2019. We took the tube to Epping and set off towards Toot Hill and Greensted. This section is known as the “rollercoaster”, as the road rises and falls in a similar fashion, a great way to get warmed up. St Andrews church provided an interesting stop and they also have a range of preserves for sale using an honesty box, which provided a shopping opportunity for some. Unfortunately at the Mill lane turnoff some of the group were separated. Thanks to GPS and mobile phones we were easily able to identify a rendezvous point, the Top Oak pub, in Stapleford Abbots and this also became the lunch stop. Refreshed and sated we continued to Lambourne End then down the hill to Abridge, the intended lunch stop, over the river Roding at Passingford bridge and on to Theydon Bois. From here we had to carry our bikes over the footbridge to take the train back to Leytonstone. It was a great ride with a good turnout, sixteen riders of different ages and abilities riding the scenic, mostly traffic free, Essex lanes under the bright winter sun. Leave us your name and email to receive updates. Thanks!